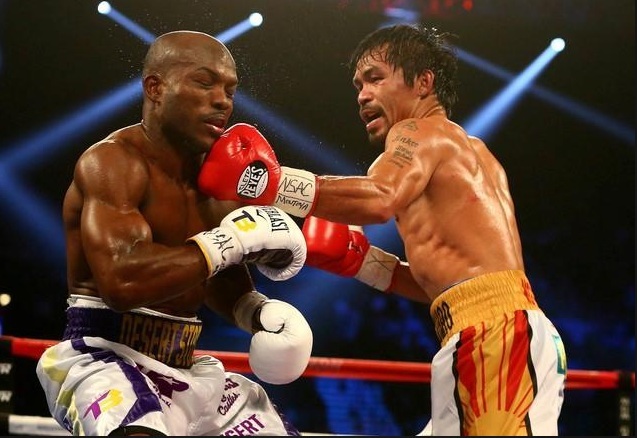 In what could be his final fight, Manny Pacquiao wins via unanimous decision over Timothy Bradley in their Las Vegas bout on April 10. Pacquiao showed his old form and landed strong punches on Bradley, sending him to the canvas twice, once in the seventh round and once in the ninth.The knockdown on the ninth round sent Bradley on a reverse somersault. Though Bradley had a higher percentage in terms of connected punches, that's 33% compared to Manny's 28%, Pacquiao landed more punches (112) than Bradley (99). The performance of Pacquiao so impressed the judges that all three of them scored 116-110 in his favor. Right after the fight, Pacquiao confirmed his earlier intention to retire. He said, "Yes, as of now, I am retired... I am going to go home and think about it, but I want to be with my family. I want to serve the people. The Sarangani congressman is running for Senator this coming national elections. He just might get a chance of grabbing a seat in the Senate. Is the 37-year old legendary boxer going to hang up his gloves for good? The Guardian quoted him as saying, "My heart is 50/50...I might enjoy my retired life or I might want to come back. It's hard to say because I'm not there yet. But right now, my decision is to retire." Sounds more like a semi-retirement than a final one, don't you think? A lot of boxers who declared they are retired. came back for one or two more lucrative fights in their careers. Think Joe Louis, Muhammad Ali, Sugar Ray Leonard, and other boxers who came out of "retirement". It wouldn;t be surprising if Pacquiao comes back to the ring, especially if he fails to obtain a Senate seat in the coming May 2016 elections.